The Palmetto Group has sold out of units at the Reserve at Demere and are now selling newly constructed condos at 400 Ocean Blvd. 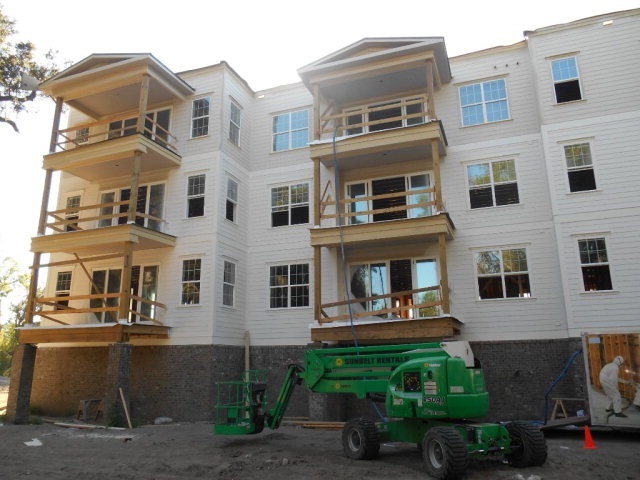 in the Village and approximately 150 new townhomes and condos at Mariner's Landing. At the Village / Pier, the Palmetto Group is offering 3 bedroom, 2 Bath, 1,250 SF condos for sale at 400 Ocean Blvd starting at $389,990. In 2016, the Palmetto Group began construction on Mariner's Landing (SSI MidSouth). Mariner's offers two basic floor plans. A popular 3 bedroom up floor plan with a single garage and a screened in porch and will start at approximately $265,000. They also have a 4 bedroom, with master on main listed at approximately $365,000. as of 9/1/2016 have reported 13 sales. There are currently 32 units being marketed for sale and buyers can expect to have a 3 to 4 month wait until construction is complete. The Villas at Gascoigne is adjacent to Mariner's Landing and features well appointed 3 BR, 2BA (1,645 SF to 1,840 SF) condominiums overlooking the south end of Epworth by the Sea. Pricing for these units start at $459,000. In total, Mariner's Landing plans to deliver over 150 new Town Home/ Condos to the St. Simons market. Located on Sea Island Road near Epworth, this new development will certainly influence existing home pricing and drive new demand as we see 2nd home buyers and investors taking advantage of affordable new construction pricing on St. Simons Island. Listing information provided by Palmetto Realty Group.